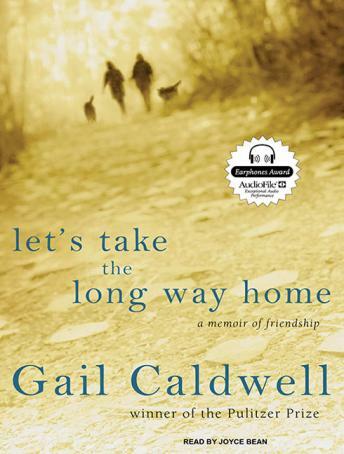 In Let's Take the Long Way Home, Pulitzer Prize–winning author Gail Caldwell offers a powerful and moving memoir about her coming-of-age in mid-life and her extraordinary friendship with Caroline Knapp, the author of Drinking: A Love Story. In her younger years, Caldwell defined herself by rebellion and independence, a passion for books, and an aversion to intimacy and a distrust of others. Then, while living in Cambridge in her early forties, Caldwell adopted a rambunctious puppy named Clementine. On one of their bucolic walks, she met Caroline and her dog, Lucille, and both women's lives changed forever. Though they are more different than alike, these two fiercely private, independent women quickly relax into a friendship more profound than either of them expected, a friendship that will thrive on their shared secrets, including parallel struggles with alcoholism and loneliness. They grow increasingly inseparable until, in 2003, Caroline is diagnosed with Stage IV lung cancer. In her signature exquisite prose, Caldwell mines the deepest levels of devotion and grief in this wise and affecting account about losing her best friend. Let's Take the Long Way Home is also a celebration of life and all the little moments worth cherishing-and affirms why Gail Caldwell is rightly praised as one of our bravest and most honest literary voices.